If you’ve been involved in a collision, the first step in the auto body repair process is getting a collision repair estimate. If your insurance company is involved, they will have one of their adjusters write an estimate. Separately, you can have a collision repair estimate written by a local body shop. There can be significant cost differences between body shop estimates. Different estimating systems may be used to write the estimate. There are three major brands of body shop repair estimating computer software used in creating estimates. Although the data used to help the estimator may be similar, there are differences between the systems and how they work that can cause differences in the final estimate. Quality of parts are used in the repair estimate. This is usually the biggest reason that there can be differences in collision repair estimates. The cost of new OEM, aftermarket parts, or OEM parts will be a major factor on the cost of repair. Insurance companies may want to use a different, or lower cost part. Some body shops may use their preferred vendor, regardless of cost. Body shops have different labor rates. There are several types of labor involved in typical collision repair: mechanical, body repair, and paint refinishing. Each of these may have a different hourly labor rate. Additionally, rates vary from shop to shop. While the hourly rates may differ by only a few dollars per hour, they can add up over the life of a repair. Some Auto Body shops offer discounts through AAA, AARP or other organizations. Others will throw in a loss leader to sweeten the deal. Things like lifetime tire rotation or a year worth of detailing can be appealing. There is nothing wrong with a shop providing value added services, you just need to know how to separate that from the repair estimate so that you can compare apples to apples. 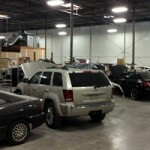 Many auto body repairs will have damage on the surface, but additional damage beneath the sheet metal. This damage can include damage to the frame and/or support systems that are critical to vehicle safety. Some shops will write a low estimate to get your business, then, once they have your car, inform you of additional repair that they discovered. Try to get some sort of assurance in writing that the estimate was thorough and covers not only surface damage, but repairs to the frame, mechanical and support systems. The body shop estimator should explain, in plain language what the repairs will cost, how the process will work, and any potential issues that could come up during the repair process. Remember, it is a process, not just an overnight repair like getting brakes done. At Bavarian Body Works, we provide quality auto body repair. We will answer any questions you may have regarding your Collision Repair Estimate and provide you options to fit your immediate needs. Contact us to arrange your Collision Repair Estimate.